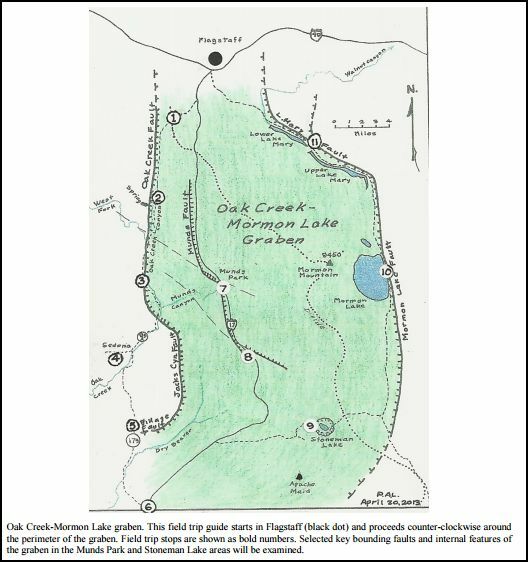 The Oak Creek-Mormon Lake Graben lies between Flagstaff and Sedona, Arizona. The Arizona Geological Society and geologist Paul A. Lindberg have produced a 13-page field guide to the geology of the area (shown on the map below). Posted in Geology and tagged earthquakes, Flagstaff, Geology, sedona, volcanics on May 8, 2015 by wryheat2. Besides oil & gas, this article provides brief information on drilling for carbon dioxide, CO2 sequestration, geothermal energy, and potash exploration. Posted in Geology and tagged earthquakes, Geology, geothermal energy, mapping, oil & gas on September 11, 2013 by wryheat2. During October, six earthquakes, ranging from 2.5- to 4.1-magnitude, occurred about 25 miles north-northeast of Morenci in Greenlee County, east-central Arizona. These earthquakes were recorded by several seismographs around Arizona, including one in Tucson. In addition, there have been swarms of lesser magnitude earthquakes in the area according to the Arizona Geological Survey (AZGS). 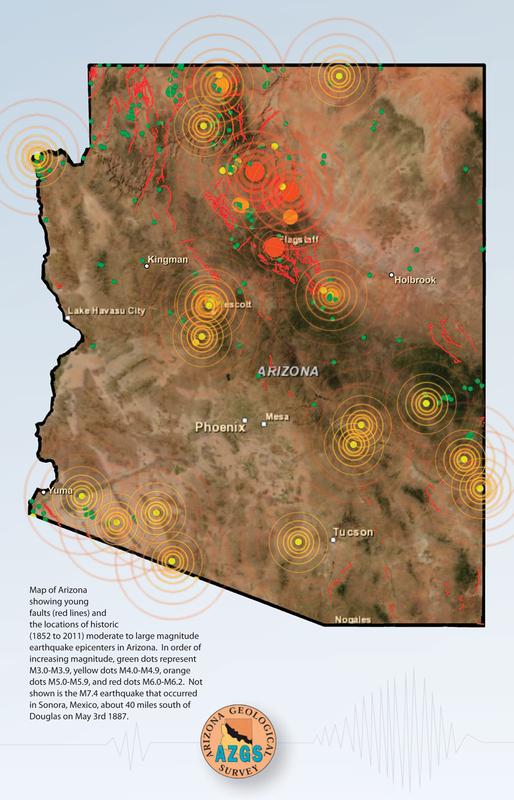 AZGS has a short article on these recent earthquakes here. The article includes maps and seismograph records. Just why earthquakes occur in the Morenci area is subject to speculation. No faults have been positively identified, but the topography suggests that a fault exists in the area. The Morenci area has long been seismically active. In May of 2010, 12 earthquakes ranging from Md 2.0 to 3.5, and 5 events below Md 2.0 occurred near the area of recent earthquakes. Arizona is divided into two main physiographic provinces. In the northeast is the high-elevation Colorado Plateau characterized by mainly flat-lying sediments. The southwest part of the state is the Basin & Range province, lower in elevation, and characterized by long, thin mountains ranges separated by fault-bounded valleys. The Basin & Range topography is the result of crustal stretching during the past 20 million years. Separating the Colorado Plateau from the Basin & Range, is the so-called Transition Zone which runs diagonally through Arizona from the northwest corner to the southeast corner. This area is characterized by faults and marks the boundary between the zone of crustal extension and the more stable plateau. The Morenci area earthquakes occur in this transition zone and may reflect continued crustal adjustment to the on-going extension. UPDATE: A magnitude 3.4 earthquake hit just before 1a.m. this morning, November 1, about 22 miles NNE of Morenci, in eastern Arizona. Posted in Geology and tagged Arizona, Basin and Range, Colorado plateau, earthquakes, Morenci, transition zone on November 1, 2012 by wryheat2. At 10:18 am on Thursday, October 18, more than 35,000 school children in hundreds of classrooms across Arizona, will drop, cover, and hold on during Arizona’s first statewide Great Arizona Shakeout earthquake preparedness drill. They will be joined by thousands more in state and federal offices, tribal communities, civic groups, and businesses and by more than 13 million nationwide (most in California). During an earthquake the greatest immediate danger in most homes and buildings is from flying or falling items – ceiling tiles, furniture, pictures, lights, mirrors, ceiling fans, and other items. Lessons learned from the 2-minute ShakeOut “Drop, Cover and Hold On” exercise can protect you, your family or students from serious injury. To participate officially, go to http://www.shakeout.org/arizona/ or if you are not in Arizona, go to http://www.shakeout.org/ This exercise has become international. Posted in Geology and tagged Arizona, earthquakes, safety, shakeout on October 15, 2012 by wryheat2. The Arizona Geological Survey has just released a new, well-illustrated 44-page book that can be downloaded for free (8Mb) : Arizona is earthquake country. The book is intended as a guide on how to prepare for and minimize damage from the ground shaking that accompanies earthquakes. It also explains the geology of earthquakes and why they occur. Young, active faults exist in and around Arizona. The northern Arizona Seismic Belt, which bisects Coconino County, hosts the greatest concentration of active faults in the state and is the most seismically active region in Arizona. Some faults, such as the Lake Mary Fault just south of Flagstaff, are capable of large magnitude earthquakes, up to magnitude 7. Yavapai, Mohave, Yuma, Pima, Cochise, Graham, and Greenlee County all host faults capable of delivering moderate to large seismic events, too. And large earthquakes on faults from surrounding states and Mexico, including California’s San Andreas fault system, are capable of damaging homes and infrastructure and threatening lives here in Arizona. “Arizona is Earthquake Country” includes a seven-step earthquake safety guide that shows how to prepare your family and home in advance of an earthquake; how to behave during an earthquake – whether indoors or out; and how to deal with damage and related issues immediately following an earthquake. The booklet provides a primer on the nature and geology of earthquakes in Arizona, describes six prominent faults, and revisits three major historic earthquakes that impacted the state. 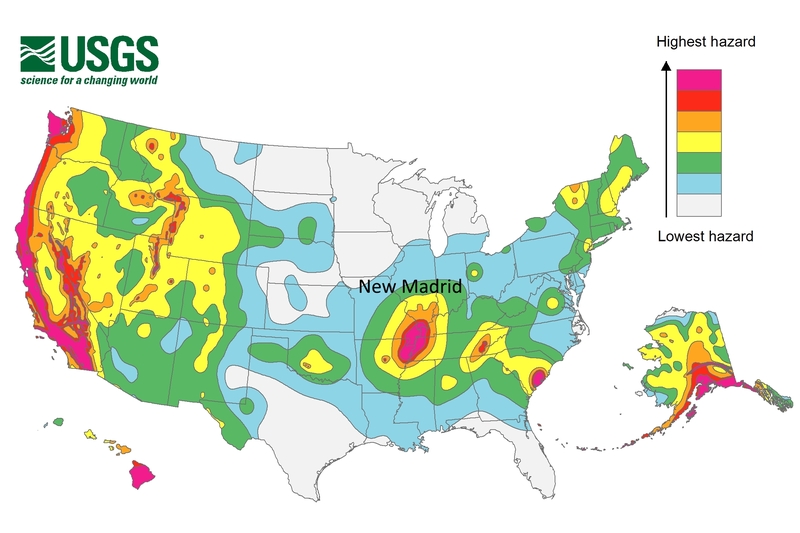 Instructions on how to use the U.S. Geological Survey’s online earthquake probability tool to establish the risk of a damaging earthquake in your community are also provided. Sections on monitoring earthquakes, earthquake resources – including online resources, and a glossary, round out the text. This earthquake preparedness guide is released just in time to complement Arizona’s first-ever Great Arizona ShakeOut, a two-minute “Drop, Cover, and Hold On” earthquake drill that can minimize personal injuries and save lives. Scheduled for 10:18 a.m. on October 18th, enrollment in the ShakeOut drill is open to all, but K-12 schools are particularly encouraged to participate; for online enrollment visit the Register Here! page. To date, more than 13,300 have enrolled in ShakeOut. Citation: Arizona Geological Survey, 2012, Arizona is Earthquake Country. Down-to-Earth #21, 44p. Besides the features mentioned in the press release above, the book also discusses how we measure the magnitude of an earthquake; it’s not the old Richter Scale anymore. Links to additional resources are given at the end of the book. For instance, for teachers in middle and high school, there is a link for earth science lesson plans and activities. There are also several links to earthquake websites maintained by government and universities. Most earthquakes in Arizona are low magnitude and go unnoticed. However, there is potential for a big one. The Arizona Geological Survey has several videos featuring earthquakes in and near Arizona. The newest is a time-lapse animation of the Brawley earthquake swarm that occurred on 26-29, August, 2012. Brawley is in southern California, just south of the Salton Sea. Time-lapse video animation of earthquakes in and around Arizona from 1852 to 2011. The apparent increase in seismic events in the latter part of the 20th century and early 21st century stems from improved seismic monitoring. It is interesting to see where the most earthquakes occur. Filmed on location in Chino Valley, two separate six minute videos describe the geometry and timing of seismic activity on these faults. This is an active fault area with a moderate recurrence rate on the order of tens of thousands of years. It is capable of yielding earthquakes in the range of magnitude 6 to 6.5 and presents a hazard to residents of Chino Valley and nearby Prescott, Arizona. Arizona has earthquakes. Geologist Dave Brumbaugh and seismic technician Lisa Linville, both of the Arizona Earthquake Information Center (Northern Arizona University), describe the role of the Arizona Integrated Seismic Network in monitoring earthquake activity in the Grand Canyon State. And Lisa deconstructs one of the broadband seismic stations that form the backbone of the system. On 3 May 1887, a magnitude 7.2 earthquake rippled across Sonora, Mexico, and southern Arizona. Phil Pearthree, Chief of the Environmental Geology division of the Arizona Geological Survey, revisits that event in this video. The earthquake killed dozens of people and damaged or destroyed several hundred structures. A similar event today would disturb and disrupt population centers in northern Sonora and southeastern Arizona and New Mexico. Posted in Geology and tagged Arizona, California, earth faults, earthquakes, Flagstaff, geologic hazards, Sonora, Yuma on October 1, 2012 by wryheat2. The Discovery Channel’s Curiosity series of DVD programs can be controversial, entertaining, and enlightening. This program presents Stephen Hawking’s view of the universe. It follows the history of our understanding of natural phenomena, such as eclipses, from religious superstition to a physical explanation. Hawking believes our universe started with a big bang, it sprang from nothing. Before the big bang there was nothing, including no time and no cause and effect. For Hawking, there is no God, no heaven, no afterlife. In a separate program on the DVD, a panel of scientists and theologians discuss Hawking’s view. They discuss the concept of multiple universes, and conclude that science can neither prove nor disprove the existence of a creator. This program, narrated by actress Michelle Rodriguez, features scientists and military strategists, first discussing the probabilities that some intelligent alien species exist, then speculating on how the invaders would go about getting rid of humans. If these people were the aliens, they would first disable our communications and other electronics with an electro-magnetic pulse (EMP), then kill many people in coastal areas by causing very large tsunamis. They would finish us off with biological warfare. It’s the stuff of good science fiction stories. This program, narrated by Martin Sheen, is about the geology and natural resources of North America. It discusses plate tectonics, mountain building and how some of our large deposits of gold, oil, coal,and iron formed. And they got the geology right. The title of this program, narrated by Samuel L. Jackson, is a bit of hype, they destroy just North America, not the world. The program speculates on five types of natural disasters. 1) California is destroyed by an ARkStorm (spelled correctly, and yes, I never heard that term before.) Basically a mega-storm with very strong hurricane-force winds, lasts about a month and dumps 10 feet of water on California, causing flooding and land slides. This kind of storm is purely speculative. See an explanation from the U.S. Geologic Survey here. 2) Asteroid impact. This scenario features Meteor Crater (aka Barringer Crater) in Arizona as an example of a “small” impact. The program explains the consequences of a really big strike. The program claims that children today have a 1 in 20 chance of witnessing a really big strike. They fail to mention how they came up with that number. 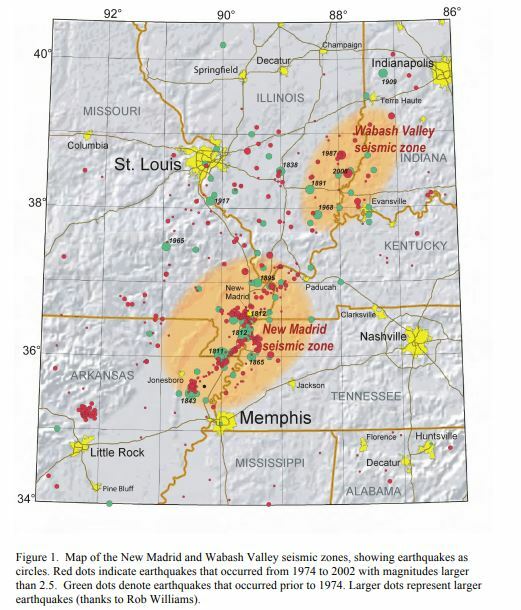 3) Mega-earthquake in mid-west along the New Madrid fault on the Mississippi River. This program recounts the earthquakes that occurred between December 1811 and February, 1812, all with strengths estimated to be between 7.8 to 8.1. These earthquakes are the strongest to hit the eastern U.S. The program goes on to speculate what could happen if an even bigger one hits. The program puts the odds of this happening within 50 years at 1 in 10. Again they don’t explain how the number was derived. 4) The eastern seaboard of the U.S. is destroyed by a giant tsunami precipitated by a major volcanic eruption in La Palma, Canary Islands. Odds of happening 1 in 1,000, same caveat. 5) Yellowstone super volcano explodes. I wrote about this one last year (see The Yellowstone Super Volcano). This volcano tends to have a major eruption every 600,000 years on average. It has been 640,000 years since the last major eruption. That one covered about half of the U.S. with volcanic ash. These programs are interesting and well-made. They show very good animations, but tend to overuse stock footage of disaster scenes. The programs are well-worth watching. The DVD is available from the Discovery Channel here. See all my book and DVD reviews here. The allegation: global warming is melting ice caps and glaciers, thereby unloading weight. This causes an isostatic readjustment of the Earth’s crust which results in earthquakes.